from esoteric.msu.edu: Until comparatively recently, there was very little scholarship on Western esotericism as a field. There were, of course, various articles and books on aspects of Western esotericism like alchemy or Rosicrucianism, but there was virtually no sense in the scholarly world that these disparate tributaries of thought formed a larger current of Western esotericism as such. One finds landmark studies in the mid-twentieth century by authors like Frances Yates, but no one who demarcated “Western esotericism” as a field for interdisciplinary or transdisciplinary study. This situation was to change with the work of Antoine Faivre (1934-) who, in the last quarter of the twentieth century, with numerous major books and articles defined an entire field of inquiry. Faivre holds a chair in the École Pratique des Hautes Études at the Sorbonne in the “Histoire des courants ésotériques et mystiques dans l’Europe moderne et contemporaine,” and his work represents the first strictly academic overview of Western esotericism. In his view, it is best to speak of Western esotericism in terms of “forms of thought” rather than in terms of “occult tradition” or similar terminology. He is interested in delineating the elements that make up particular ways of thinking we can mark as “esoteric,” and this methodological approach has been widely accepted. In his definitive book Accès de l’ésotérisme occidental, (1996), he demarcates four primary and two secondary characteristics that he sees as common to all the various currents of Western esotericism. 4. Transmutation 5. Praxis of Concordance 6. Transmission. Of course, these same elements can be found in other traditions, as various scholars have pointed out, which has led some scholars to question the utility of these six characteristics . If they can be found in Mahayana and Vajrayana Buddhism, for example, or indigenous religious traditions, then are these characteristics not too broad to be of definitive use? Correspondences between macrocosm and microcosm, living nature, the use of the visionary imaginative faculty, and the possibility of transmutation as well as transmission are certainly not unique to Western esotericism. One might well wonder whether, drawing on Faivre’s characteristics, one might be actually fashioning a larger framework for analyzing esoteric traditions both Asian and European in origin. 4. a spiritual leader who guides his or her spiritual circle through letters and spiritual advice. 6. visionary insight into nature and non-physical realms, though 6. is actually a subset of 2. I have yet to find a single figure in the theosophic current who does not exemplify at least four of the first five characteristics listed here . The chief benefit of focussing on particular currents like theosophy is that one can achieve a reasonable degree of precision in determining whether a particular figure or school of thought belongs to the theosophic current by seeing whether it corresponds to these six characteristics. Using these characteristics, we can see, for example, that the “Theosophy” of Helena Blavatsky, though it includes some of these elements (for instance, an emphasis on cosmological gnosis and a notion of spiritual leadership), does not belong to the current represented in the theosophy of Jacob Böhme and subsequent theosophers. It is, in brief, considerably easier to discern characteristics that join theosophers and separate them from other groups than to find characteristics that join all forms of Western esotericism, let alone characteristics of transcultural esotericism. The most important element missing from Faivre’s list of the characteristics of Western esotericism is gnosis. This concept he did not include most likely because it introduced something inconvenient: what often goes under the rubric of “mysticism.” Now the term “mysticism” is fuzzy; one often can’t discern whether the word is being used to refer to visionary experiences, to non-visionary via negativa experiences, or to something else. Much preferable are descriptors added to the term “gnosis,” which refers to direct spiritual insight either into hidden aspects of the cosmos, or into transcendence. Then one may speak of “visionary gnosis,” or of “via negativa gnosis,” without the confusion that “mysticism” generates; the kind of gnosis in question becomes clearer by the term preceding it. I am using the word “gnosis” to refer to 1. knowledge or direct perception of hidden or esoteric aspects of the cosmos (cosmological gnosis) as well as to 2. direct spiritual insight into complete transcendence (metaphysical gnosis). Cosmological gnosis still entails a subtle dualism of subject-object, to some extent belongs to the realm of knowledge, and reveals correspondences between subject and object, or between humanity and the natural world. These correspondences may be drawn upon to achieve some aim, as in alchemy, astrology, or magic. Metaphysical gnosis is non-dualistic spiritual insight, as one finds in the work of Meister Eckhart or in that of the contemporary American author Bernadette Roberts. This distinction, Lee Irwin points out, is comparable to that found in the Corpus Hermeticum between “lower” and “higher” gnosis, “lower” referring to philosophic learning, “higher” to direct insight into the Nous. Faivre is keen to separate “mysticism” from “Western esotericism,” but such a division is artificial, and indeed, impossible in practice. A case in point is the seminal work of Jacob Böhme, central to which is his spiritual insight, or gnosis. I do not think Böhme can be properly understood without reference to the pivotal concepts of ungrund and nichts, the via negativa gnosis at the heart of his visionary gnosticism . My point is that if one cannot understand such a central esoteric author as Böhme without reference to gnosis, then how can one exclude this term from the list of characteristics entirely? One must take gnosis into account . Of course, when one takes gnosis into account as a characteristic of the larger current of Western esotericism, one has to acknowledge not only its presence in the works of Böhme and the theosophers and in such alchemical treatises as those in the 1675 collection entitled The Hermetic Museum, but also in the works of figures like Bernadette Roberts or Franklin Merrell-Wolff. Figures like these two would certainly be excluded from a Faivrean overview of Western esotericism and classed as “mystics,” yet their work is without question esoteric (not for the masses), and “Western” in origin, belonging to the Catholic line of Eckhart and the American line of Emerson respectively. Naturally, we could exclude such figures, but then we would also have to exclude the various individuals known as “Gnostics” in antiquity, Dionysius the Areopagite, John Eriugena, Meister Eckhart, John Tauler, aspects of Jacob Böhme and the theosophic school, and indeed, nearly all those who represent apophatic (or, in the case of Böhme, hybrid visionary-apophatic) gnostic currents. If we include in “Western esotericism” broadly speaking these gnostics, who also do have representatives in the period from 1575 to the present, then we have another central characteristic of Western esotericism to deal with. And in fact I would suggest that without the concept of gnosis, the concept of Western esotericism is itself impoverished, so central is this idea in many of these various currents of thought. Faivre’s six characteristics describe well what we may call the cosmological domain to which many currents of Western esotericism do belong, incorporating as it does such disciplines as practical alchemy, astrology, geomancy, and other forms of divination, as well as secret or semi-secret societies like that of the Rosicrucians, various magical lodges or orders, and so forth. All of these depend upon the doctrine of correspondences. What is more, much of Böhmean theosophy belongs to the cosmological domain—one thinks of the doctrine of signatures, the triadic nature of the Böhmean cosmos, and so forth. Böhme too offers a profoundly esoteric view of nature. But to acknowledge the primacy of the cosmological dimension in what has come to be known as Western esotericism must not entail denying the presence of a metaphysical gnostic dimension at least in some of the same currents of thought. This said, the basic principle behind Faivre’s methodology—a strictly historicist approach seeking primary definitive characteristics of esotericism—is a necessary one. We need definitions of terminology and of primary concepts, and even if Faivre’s listed characteristics may be in need of revision, the conceptual and historicist framework informing them is of great value in construing the new field. The second major author on methodology in Western esotericism is the Dutch professor Wouter Hanegraaff, who holds the first specially endowed university chair for the study of Western esotericism—in particular, for the study of Hermeticism and related currents—at the University of Amsterdam. In a series of major articles, Hanegraaff has not only outlined the major contemporary approaches to the study of esotericism, but also proposed his own methodological approach. Hanegraaff argues that an a priori typology might well be valid, but it should not be a foundation for understanding the field as a whole, and that indeed, “a fully-developed academic study of esotericism should give attention to all the dimensions which may be distinguished in religious traditions generally (social, ritual, experiential, doctrinal, mythic, ethical, and symbolic) .” Essential to Hanegraaff’s methodology is what he calls an “empirical” approach, meaning among other things that the empiricist scholar seeks as much as possible not to apply a priori ideological constructs to esoteric subjects, but rather to approach his or her subject with an informed, open, and, so much as possible, neutral mind. Hanegraaff follows a distinction between an emic and an etic approach to religious studies. The emic approach is that of the alchemist or theosopher as an alchemist or theosopher; Hanegraaff also makes reference to a “religionist” perspective, meaning an emic perspective from within a particular religious viewpoint as opposed to a more neutral historical or etic approach. “Essential to the scholarly integrity of any etic interpretation is that scholars remain permanently open to criticism from colleagues, who may challenge the validity of their interpretations,” Hanegraaff writes . For “as soon as a scholar shuts himself off from criticism, research begins to degenerate into ideology.” But, he continues—and this observation is critical—”A continuing and (self-) critical dialectics of emic material and etic interpretation, in contrast, is the indispensable foundation for an empirical study of esotericism which wishes to go beyond mere description.” For Hanegraaff, most important is an open-ended “process of understanding” “in which no interpretation may claim to have the final word” (13). One might misunderstand Hanegraaff’s emphasis on an etic, empiricist, historiographic perspective as giving rise to an anti-esotericism masquerading as a study of the subject, but in fact when one looks at Hanegraaff’s own work, one finds that he remains a studiously neutral commentator willing to understand and convey his subject in the best, most comprehensive way possible. Still, one has to wonder about the implications of the sharp division he makes between a “religionist” perspective and an “empiricist” one. Let us consider, for a moment, the example of an alchemical treatise. It may well be that this treatise includes arcane allusions to alchemical work that only a practicing alchemist would recognize and understand. We could envision an etic approach to this treatise that completely fails to recognize what the treatise conveys on alchemical discipline, whereas an emic approach might very well be the only one that could get at what the alchemical work is actually about. In this case, as in a number of others I might also cite, a sympathetic empiricist perspective may well be indispensable for understanding the work one is investigating. And this, in fact, is the methodological approach that I am advocating here. A quite relevant debate continues to take place in the field of Buddhist studies. The question is: can someone with no practical knowledge of Buddhist meditation, say, adequately or accurately convey a tradition to which meditation is central? Or does the best scholarship need to be informed by direct knowledge of the actual practices about which one is writing? I am reminded of a fairly prominent professor of Zen Buddhism who told me directly that not only was it not necessary to practice Zen meditation to answer koans, but what is more, he could answer correctly any koan through entirely rationalistic means! I doubt that his answers would meet with the approval of a Zen Buddhist master, but such remarks are a measure of the chasm between many Western academics on the one hand, and that which they purport to study on the other. Is it appropriate to presume to answer or pronounce upon koans as an academic who has not actually practiced Zen Buddhism? It is indeed a bizarre assertion to claim so, at least in my view. By “sympathetic empiricism,” on the other hand, I am referring to an intermediate position that incorporates the best of both emic and etic approaches. In the field of Western esotericism, as in that of religious studies more generally, it is important to balance on the one hand the virtues of scholarship that strives to achieve a standard of objectivity, and on the other hand the virtues of an approach that seeks to sympathetically understand one’s subject, to understand it from the inside out, so to speak. Anthopologists have long understood the importance of balancing etic and emic approaches, of on the one hand entering into a culture in order to understand it while on the other hand retaining the status of observer and analyst. If the vice of a too emic position is that of becoming an apologist, the vice of a too etic position is if anything greater: a failure to understand and accurately convey what one is studying. If the vice of the extreme emic approach is too great a sympathy, that of the extreme etic approach is ignorance of and hostility to one’s subject, even if under the guise of a studied neutrality. 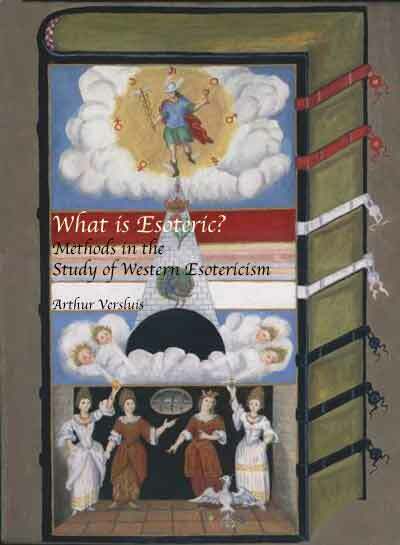 Western esotericism is a field in its formative years, and it is, I believe, vitally important that scholars in it remain aware of their methodology and in particular of the dangers inherent in approaching this delicate, subtle, and sophisticated field without a sufficient appreciation not only of their subject’s historical context, but also of its underlying premises, or to put it another way, of their subject’s metaphysical and cosmological self-understanding. There is, of course, continuing academic debate over the value of reductionism as an approach to religious studies . As Wouter Hanegraaff has outlined in his important articles on methodology in the study of esotericism, approaches can be delineated into a number of categories, chiefly pro-esotericist, anti-esotericist, and an empirical-historical approach . But I will here loosely characterize empirical-historical approaches to esotericism as in turn also existing on a spectrum from “internal,” meaning writing from within the perspective of the tradition itself, to “empiricist,” meaning a more or less neutral approach, to “reductionist,” meaning an effort to reduce a given religious subject to non-religious constituent parts—i.e., power relationships, social constructs, and so forth. Now, given it is possible for someone to write from an empirical perspective—i.e., as a more or less neutral observer of historical figures, works, or events—one may still acknowledge and draw upon what I will here call a sympathetic or, as Hanegraaff puts it, an emic approach, drawing upon the perspective of the alchemist or theosopher without for all that presenting oneself as an alchemist or theosopher. Such an approach is, I believe, particularly important in the field of esotericism because otherwise one runs the very real risk of distorting one’s topic by attempting to reduce it to something else. A recent proponent of reductionism writes that opponents of reductionism fear “ontological reductionism,” so “the putative transcendent” will be lost, and adds that “we need to know what relevance this threat of reductionism would have for a serious analysis of the tea ceremony, or of the women’s movement, or of the Confucian civil service .” A more relevant question, however, would be what is lost if one finds a scholar attempting to approach, say, Böhme’s profound writings on the Ungrund and attempting to reduce or rather, to distort them to socio-political constructs (to give a hypothetical example). The real problem with reductionism is that it may well lead to profound misreadings or distortions of primary sources—in brief, I argue that some sympathy with the authors and works one is studying is necessary to understand them. Hence I believe it is extremely important to attempt to remain faithful to the subject one is investigating. That comparative religion can lead one astray is obvious, and an example readily to hand is that of the early scholar of Tibetan Buddhism L. Austine Waddell, who argued that the ritual empowerment of pills (Mani-rimdu) in Buddhist Tantra resembles the Christian eucharist, and that therefore this tradition of ts’ewang could have originated in Nestorian Christianity . As Geoffrey Samuels points out, in fact the two traditions only very superficially resemble one another, but this resemblance did lead Waddell and others to speculate on some sort of historical influence of Christianity on Buddhist Tantra . Waddell’s work may be of some value as an example, but it is certainly marred by his incessant denigration of Buddhism as demonic in origin (hence his need to posit a Christian origin for a Tibetan Buddhism “eucharist.” His work thus can be seen as anti-esoteric, and as reductionist. In recent years, the field of religious studies has sustained a number of controversies and even attacks from within concerning the nature of the field and the degree to which it is still indebted to its origins (within the Western university) in Christian theology. Such controversies are themselves often motivated by various kinds of reductionism. One argument, belabored at great length in recent books by Timothy Fitzgerald and to a lesser degree, by D.G. Hart, is that the entire field of religious studies is fundamentally flawed by what critics believe are its often hidden Judeo-Christian assumptions . This argument, however, (if and when it is indeed a valid argument and not grossly overstated) applies to comparative religion and in particular to comparisons between monotheistic and non-monotheistic traditions—it does not apply to the field of Western esotericism inasmuch as the field exists largely (although by no means exclusively) in a Judeo-Christian context to begin with.